This tiny early-stage black swallowtail caterpillar (greatly enlarged in this photo) is about 1/4 inch long and barely thicker than the parsley stem it is crawling on. If it's viewed from a couple of feet away, it looks like a bit of dirt or a bird dropping. Whether you're thinking about a 4-year-old girl or a 12-year-old boy, some of the fun of growing up in a place like Westborough comes from discovering its wildlife, including caterpillars. Typically kids are more curious about caterpillars and other creepy-crawly creatures than most adults are, but many adults remember the interest they had as kids. Throughout the growing season, as long as there's green vegetation, kids are likely to find caterpillars. As with so many other creatures, the focus of a caterpillar's life is eating and trying not to be eaten. It doesn't reproduce because that's the job of the butterfly or moth – the next stage of life. A brand new skin. This late-stage black swallowtail caterpillar or "parsley worm" has just crawled out of its old skin, quite literally. It is now about 1 inch long. The old skin lies crumpled behind it. Take the caterpillar of the eastern black swallowtail butterfly (Papilio polyxenes), featured in Nature Notes two weeks ago. It hatches from a yellow egg that the female butterfly has laid on its food supply, perhaps on some roadside Queen Anne's lace (Daucus carota), or on some parsley, carrots, or dill in a Westborough garden. To find the right plant for its offspring, the female butterfly has flown around, sampling various plants. She uses her sense of smell to find them. You may notice a female touching down briefly on leaves to scratch and "taste" them with her feet as she looks for the right plant. The black swallowtail lays a few yellow eggs one at a time on different leaves. Some other kinds of butterflies lay eggs in batches. After a week or so, the black swallowtail caterpillars hatch. At this early stage, these tiny caterpillars are black with a white saddle in the middle. This color scheme protects them from being eaten – or picked off your parsley – by making them look like specks of dirt or bird droppings. Caterpillars are often called eating machines, but as they eat, they grow – just like kids. And as they grow, they outgrow their skins, much as kids outgrow their clothing. What then? They shed their old, too-tight skins by crawling right out of them. 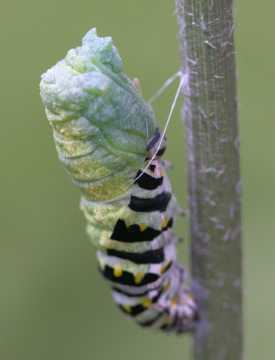 Once that's done, black swallowtail caterpillars turn around and eat the old skin. Caterpillars typically shed their skins four or five times. 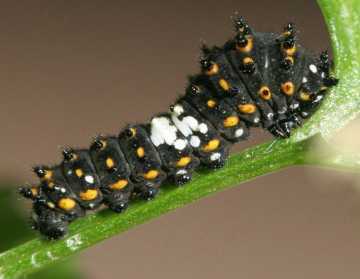 As it gets bigger, the black swallowtail caterpillar needs different coloring to protect it. 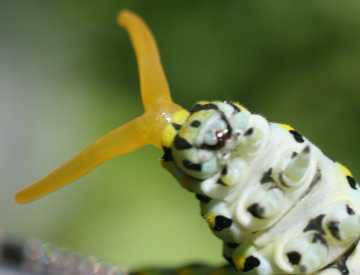 In its later stages, it has the green, black, and yellow striped pattern of a "parsley worm" that many gardeners recognize. This color pattern breaks up the image of a fat caterpillar, making it harder to spot among the lacy leaves of Queen Anne's lace or the curly, deeply cut leaves of parsley. Don't mess with me! This black swallowtail caterpillar feels threatened – perhaps by ants, a wasp, a bird's beak, or squeezing human fingers – so forked orange "antlers" pop out from behind its head and give off a strong odor as the caterpillar thrashes around. This caterpillar is looking down at the camera. Vast numbers of caterpillars become bird food, but they have other predators as well. What happens to them is the stuff of horror movies. Some types of wasps and flies prey upon caterpillars by using them as a nursery for their own young. These enemies don't kill the caterpillars outright. Instead, they lay their eggs inside the living caterpillar. When the eggs hatch, the caterpillar gets eaten from the inside. Black swallowtail caterpillars have a special defense that they use if a wasp, ant, or bird's grasping beak threatens them. Something dramatic happens. Forked orange "antlers" pop out from behind the caterpillar's head and give off a strong, unpleasant odor as the caterpillar thrashes around. This sudden response can be enough to scare off the predator. 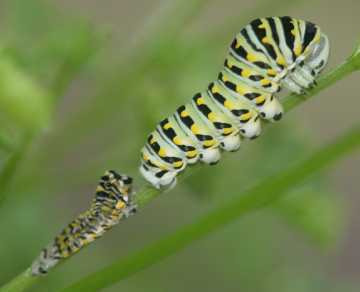 After a couple of weeks of eating, a black swallowtail caterpillar gets to be about 2 inches long. It needs a new disguise to protect it in its next stage of life, while it rests and transforms into a butterfly. So, like other butterfly caterpillars, black swallowtails form a sort of casing called a chrysalis. A new disguise. Held securely in place with silk, this green chrysalis is shedding its striped caterpillar skin. This one will look like a green leaf, but sometimes the chrysalis is brown, like a dead leaf. Each kind of butterfly has a different-looking type of chrysalis. Moths, on the other hand, usually make cocoons. Many adults have fond childhood memories of keeping a chrysalis or cocoon and eventually finding that a butterfly or moth had emerged. Today's kids can watch nature in action in the same way. If a kid you know finds a caterpillar, just put it in a roomy, clean jar, along with a stick and fresh leaves from the plant that the caterpillar was on or near. Put some mesh, such as cheesecloth, over the opening to the jar, so there's air flow. Add fresh leaves if the caterpillar eats. Sooner or later – often sooner – the caterpillar will be gone, replaced with a chrysalis or cocoon in the jar. Then just wait, and check the jar regularly. With luck, in a few weeks, or maybe next spring, a butterfly or moth may emerge. Then it's time to let it go and watch it fly away!